Single supernova at four different points in space at four different points in time? I was trying to explain to a friend how a single supernova explosion that happened only once, at a single point in space was observed at four different points in space AND at four different times (50-80 years apart!). The key is gravitational lensing and I suspect I didn’t explain it very well because of the observed blank reaction. You can see a heavy object (e.g. Sun) pull something else (e.g. Asteroid) towards itself due to gravity, changing it’s path. If you replace the Asteroid (reasonably heavy) by a photon (incredibly light), you need to replace the Sun by something FAR more massive. Not just several stars, not even an entire galaxy. 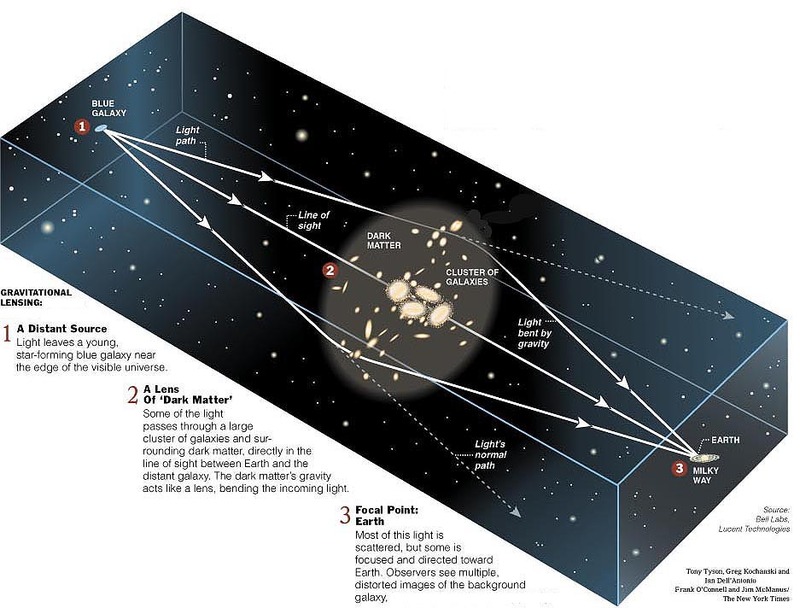 You need a big cluster of galaxies and their surrounding dark matter (upto 3x the mass of the galaxy cluster itself). But the universe is a large place and these things exist all around us, so no biggie. How does that actually look? You’d see curved lines that are in fact galaxies lying behind the “gravity lens”. The actual shape of the galaxies is distorted because of the gravitational lens in between that galaxy and us. Now what happens if a galaxy lies exactly behind the gravity lens instead of just a bit to the side? Well, you’d get something like the image below, where its almost a circle around the gravity lens. It’s not exactly a circle because the alignment is not 100% exact. Check the image below. The single supernova was spotted at 4 different locations (see the lower right inset). What even cooler is that light from the same explosion traveling in slightly different directions is getting bent by the same intermediate galaxy cluster and will reach Earth at different points in time (see the top inset). In fact it’s calculated that we already missed the first few images about 50 and 30 years back and we’ll be able to see the same explosion again in the future when photons from the longer routes reach earth. Imagine bazillion messengers leaving the explosion at once, but groups of them taking different routes. Most just go out elsewhere in space but the few groups that do make it to Earth make it so at different times of arrival, spaced out by several decades. NOTE: All images are copyrights of their respective owners. Used here for educational purposes under the fair use doctrine.